It’s hard to describe “The Florida Project” in a way that conveys its greatness without making it sound maudlin and sentimental. It is one of those films that defies its plot description through its execution. It is a film of small notes that combine to form something major, the kind of movie that sneaks up on you and sticks with you. Like last year’s Best Picture winner, “Moonlight,” it achieves much of its brilliance through specificity. It is an all-too-common story of a single mother and her daughter on the edge of the social ladder, but it is told in a way that embraces its details instead of trying to achieve some sort of universal statement. Co-writer/director Sean Baker very carefully conveys the specific truths of his characters’ daily lives and it’s that honesty that makes “The Florida Project” so powerful. This is a remarkable film, one of the best of the year. The Magic Castle motel is the kind of place most people don’t even notice as they speed past it on their way to the Magic Kingdom. On a strip of cheap motels, gun stores, tourist traps, and various other establishments, this motel houses all kinds, from the tourists looking for something cheap (or, in one of the movie’s funniest scenes, booking the wrong hotel) to the working class who have basically turned it into permanent lodging. Baker very purposefully introduces us to his child protagonists first, best friends Moonee (Brooklynn Prince) and Scooty (Christopher Rivera). They’re running to a neighboring motel so they can spit on a car from the balcony above. It’s just one of those silly things kids do when they have nothing else planned. Just another day near the happiest place on Earth. After the owner of the car gets angry, Moonee and Scooty get a third partner-in-crime in her granddaughter, the sweet Jancey (Valeria Cotto). And here’s where we get to one of those aforementioned points where “The Florida Project” becomes hard to put into words. If I tell you that it consists largely of the adventures of these precocious motel-residing kids, it would probably sound like some horribly cloying piece of Hollywood trash, those movies that idealize youth and really look down on poverty. Baker does neither. And the tonal balancing act of “The Florida Project” is the main thing that makes it so breathtaking. We basically journey through the day-to-day life of a wide-eyed, funny, creative kid, the kind who puts a dead fish in the pool to bring it back to life and turns off the power to the entire motel just to see what happens. There’s nothing overly special about Moonee or her life in typical movie ways. Every day is a bit of an adventure for Moonee, but Baker is careful not to romanticize that at the same time. He recognizes that Moonee is kind of a unique kid, the sort who can get a kick out of making noises into an oscillating fan or brushing her doll’s hair in the tub, but he never makes her into a precocious Hollywood cliche of the wide-eyed innocent. Moonee knows the deal. She knows more than most adults around her. But she wants to have fun everyday. Of course, it helps Baker greatly that he found a future star in Brooklynn Prince, who gives one of the best child performances in years. She’s so genuine that you forget that Moonee is a character, falling completely into her life as if it’s true. As “The Florida Project” progresses, we realize that Moonee’s mother Halley (Bria Vinaite) is sliding away socially and economically. She struggles to make the rent, can’t get a job, and sells perfume in the parking lots of the fancier hotels in Orlando. It’s not adding up to enough to keep her family fed or a roof over their head. Someone else who senses that Halley and Moonee are good people on slippery terrain is the hotel manager Bobby, played perfectly by Willem Dafoe. In a long, very notable career, this is one of Dafoe’s best performances. Like Moonee’s story, Bobby’s appearances in the film are often episodic, but Dafoe uses these little beats to create a fully three-dimensional character. He has seen dozens of Moonees and Halleys come through his motel, and yet he can’t quite completely detach from the human lives in the rooms he rents. It is a perfectly modulated, beautiful piece of work. What first feels episodic in the structure of “The Florida Project” becomes something more of a statement about the repetition of ordinary lives. We see Moonee do so many things multiple times—get breakfast from her mother’s best friend’s restaurant, get ice cream from a nearby establishment, hustle tourists to sell perfume, etc.—and it becomes a very effective way to add realism to Baker’s film. Even Bobby is shown pecking away at his keyboard or remodeling the motel multiple times. There’s no romanticism of these lives, and yet there’s never a sense of drudgery either. It’s a breathtaking balance of the two that really makes the movie work, and it culminates in a final scene of striking beauty—the kind that you don’t soon forget. Some of our greatest films achieve their greatness by presenting us with characters who feel completely fully-realized and three-dimensional. We feel like we know Chiron from “Moonlight” or Lee from “Manchester by the Sea.” Moonee, Hailey, and Bobby achieve the same kind of life beyond the film about them. It’s enough to make you want to slow down the next time you pass a place like the Magic Castle and look more closely at the lives unfolding there. It takes a very special movie to change the way we look at the people around us. 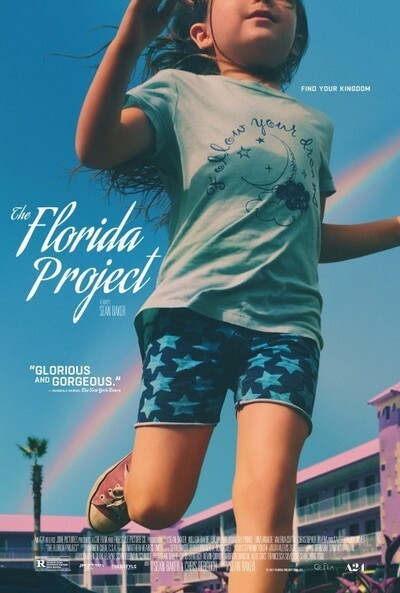 “The Florida Project” is a very special movie. This review was originally published from the Toronto International Film Festival on September 8, 2017.